The Arcing Path Course is now available in Spanish! There are many scholarships available for those wishing to enroll in feedback and discussion enrollments, so let your Spanish-speaking friends know! Queremos iniciar 2017 ofreciendo el primero de quince nuevos cursos en español de Biblearc, conjunto que hemos denominado Cursos del Sendero. ¡Hay becas disponibles para estos cursos! Acerca de este curso: Este curso expone los conceptos fundamentales y las estructuras necesarias para comenzar a utilizar el método de estudio bíblico llamado Arcing (Arqueo Bíblico). El Arcing ha sido puesto a prueba y ha demostrado ser una excelente herramienta para cavar profundamente en la Palabra de Dios. Únete a nosotros en un estudio que te desafiará a pensar mucho más y a sumergirte bajo la superficie a medida que trabajamos juntos en el primer capítulo de Santiago. Un Curso Interactivo en Línea: Los cursos de sendero están diseñados para ayudarte a profundizar en tu estudio de la Escritura a través del rigor académico y un corazón de adoración. Hemos establecido quince cursos a lo largo del espectro del entrenamiento en el estudio bíblico para que haya algo para todos, tanto nuevos creyentes como pastores veteranos, madres que se quedan en casa y misioneros. Convenientemente, estos cursos están en línea con componentes creativos e interactivos diseñados para ayudarte a perseverar hasta el final dentro de una comunidad mundial de estudiantes. También puedes aprovechar la interacción personal con los instructores de los cursos de varias maneras. Finalmente, los cursos del sendero han sido diseñados para equiparte en el uso de la extensa caja de herramientas de estudio de Biblearc mientras que aprendes a descubrir las glorias de la Biblia por ti mismo. Las becas disponibles para este curso son el resultado del generoso aporte de algunos donantes que desean promover el estudio serio de la Palabra de Dios por medio de Biblearc en América Latina. Ellos han provisto de 60 becas completas para inscripción con Retroalimentación y 93 becas completas para inscripción con Grupo de Discusión. No desaproveches esta oportunidad de aprender a profundizar en la maravillosa Palabra de Dios. We have prepared these cheat sheets that will help you memorize the passes of Phrasing, the types of phrases, the relationships and a non-exhaustive list of conjunctions and prepositions with their respective relationships and examples. 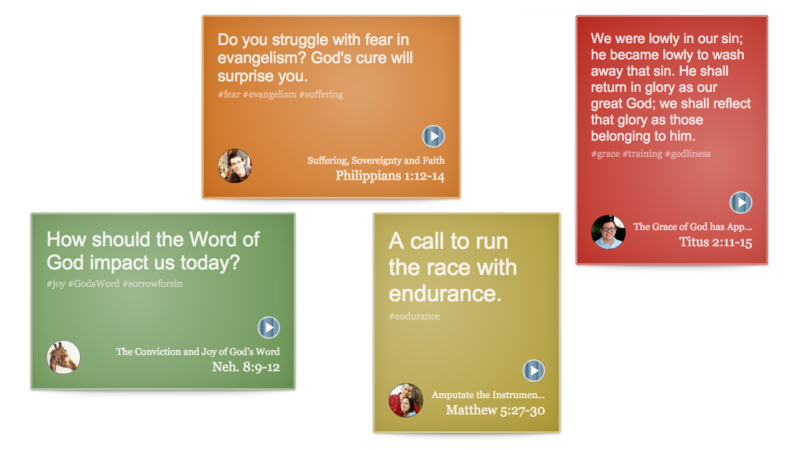 All of Biblearc…now in the palm of your hand. This online, interactive course lays out the foundational concepts and structures necessary to begin using the Arcing Bible study method. It features personal and extensive feedback on eight different assignments. We will take a hands-on approach to learning as we work through the first chapter of James together. Format There will be nine 30 minute lectures, released twice per week. Each lecture will be followed by an assignment due three days later. Assignments turned in on time will be corrected and returned before the release of the next lecture. Assignments turned in late, but prior to the end of the course, will be corrected and returned within three days. Lectures will be indefinitely available to participants. Course length This is a 5-week course. Discussion enrollment In addition to lectures and feedback, discussion enrollment gives you a one-hour group discussion time each week with the instructor of the course. Groups are made up of 5-9 students. Rated 4.6 / 5 stars in significance by former discussion enrollees. One-on-one enrollment One-on-one enrollment allows you to enjoy a half hour of one-on-one time with the instructor each week, in addition to the standard provisions of the course. Rated 4.7 / 5 stars in significance by former one-on-one enrollees. Work load Between the lectures (1 hr/wk) and assignments (~5 hrs/wk), participants should expect to spend approximately 6 hours per week on this course. 99% of former students surveyed recommend this course to others! Announcing the six 2015 Fall courses on Biblearc—three in September/October and three in November/December. As always, our courses are online and interactive. May they help you dig deeper into the inexhaustible riches of God’s Word. This course lays out the foundational concepts and structures necessary to begin using the Arcing Bible study method. We will take a hands-on approach to learning as we work through the first chapter of James together. Your “hermeneutic” is the method or principle you use when interpreting the Word of God. This course will examine this subject with the conviction that our hermeneutics are best developed by paying close attention to how in fact the Bible speaks of and interprets itself. This course will also provide a brief survey of all the Bible study methods employed on Biblearc. 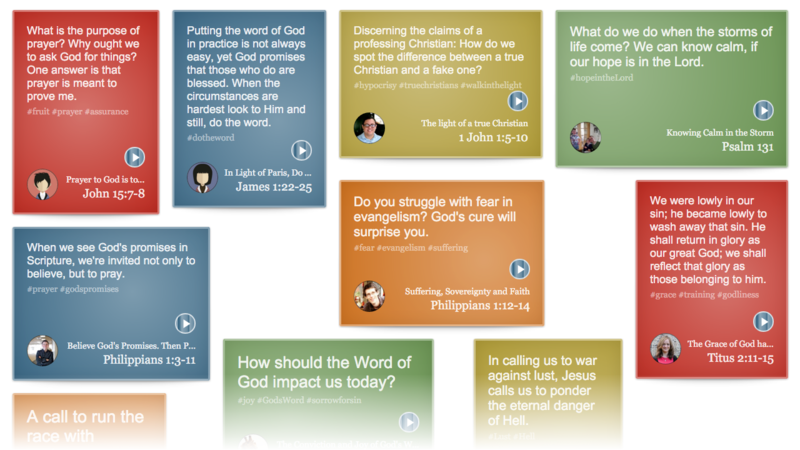 In this course you will learn the art of asking questions of the biblical text. 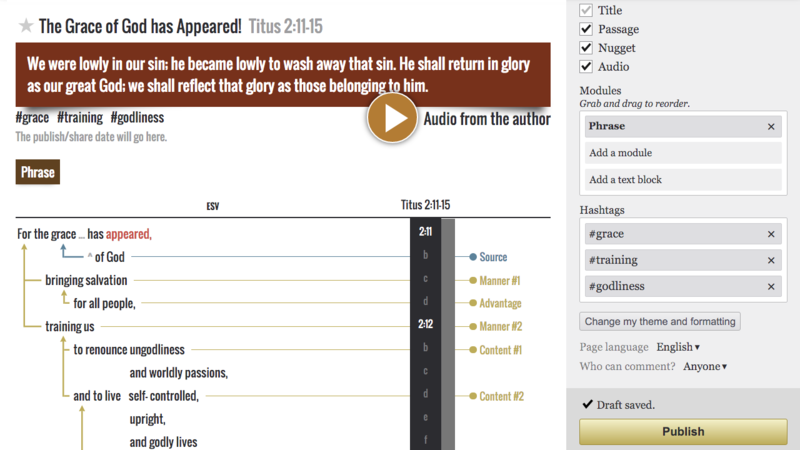 We will focus on marking up the text via Biblearc’s Look-up module and reading the Bible with purpose. Our aim is to send you away with both a method of study and insights from scripture which will serve you the rest of your life. Interactive lectures This course includes five interactive, 2-hour lectures, in addition to an introductory lecture the first week. You may watch these lectures live, or at your convenience. One-on-one and Discussion enrollment students will be invited to participate in the lectures via online video chat. Live lecture recording times will be scheduled in coordination with these students the first week of the course and then announced to all students. Discussion enrollment In addition to lectures and feedback, discussion enrollment gives you a one-hour group discussion time each week with the instructor of the course. Groups are made up of 5-9 students. Rated 4.6 / 5 stars in significance by discussion enrollees of other Biblearc courses. Assignments This course includes five Markup assignments which will be promptly corrected by the instructor and returned each week. Instructor Josué Pineda has worked as a pastor and church planter in Honduras, was the Director for Honduras of Precept International Ministries, and has spearheaded Biblearc’s Arcing courses in Spanish. Work load Between the lectures (2 hrs/wk) and assignments (3 hrs/wk), participants should expect to spend approximately 5 hours per week on this course. Interactive lectures This course includes seven interactive, 2-hour lectures, in addition to an introductory lecture the first week. You may watch these lectures live, or at your convenience. One-on-one and Discussion enrollment students will be invited to participate in the lectures via online video chat. Live lecture recording times will be scheduled in coordination with these students the first week of the course and then announced to all students. Course length This is a 8-week course. Work load Between the lectures (2 hrs/wk) and assignments (3-4 hrs/wk), participants should expect to spend approximately 5-6 hours per week on this course.